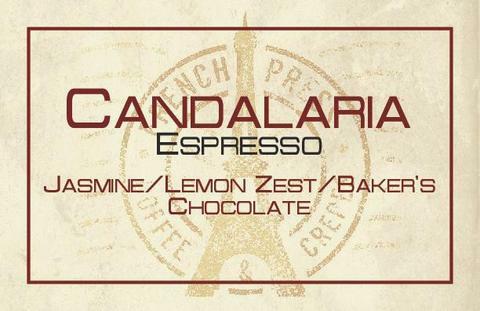 Candalaria is a unique, seasonal blend featuring coffees from the major growing regions of Latin America & East Africa. With floral aromatics of jasmine & cedar, ripe fruit notes of cherry or citrus, a caramel-like body & an enduring, syrupy finish, Candalaria is meticulously designed to provide a wide spectrum of complexity catered to any brew method of choice. Our signature, seasonal blend depends on multiple growing regions to attain an intricate flavor profile combination of fruits, milk chocolate and caramel. Each coffee origin that make up this blend can stand alone. However, it is the amalgamation between their flavors that characterizes the foundation of our espresso blend. Heavy floral scent with aromatic cedar & jasmine. Sweet raisin, lemon zest & roasted almonds, dominated by a smokey semi-sweet chocolate.